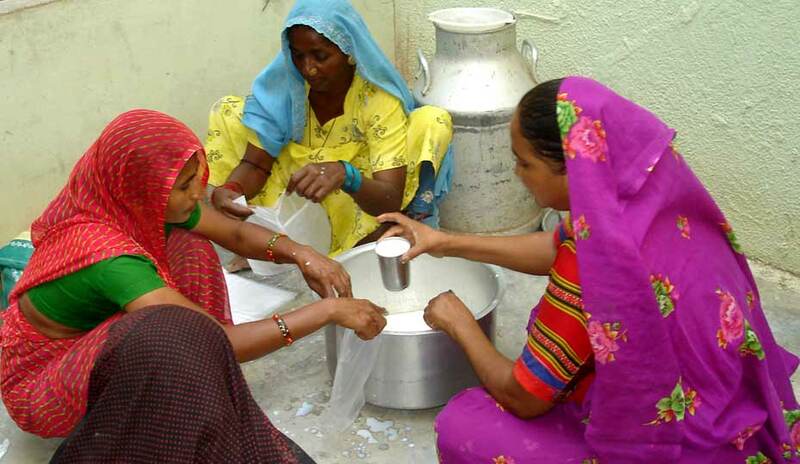 Saiyere Jo Sangathan (SJS) or the Collective of Women Friends is a federation and community based organisation managed by rural women entirely and serving 4100 women in 54 villages across four clusters in Nakhatrana and Lakhpat Block in western Kutch. SJS has been operational as an autonomous, registered organization since the past 10 years. SJS has been sponsored and organized by Kutch Mahila Vikas Sangathan, a network of rural women’s collectives dedicated to the development and empowerment of women in Kutch District. KMVS has been operational in Kutch since 1989. The Sangathan has been registered as a Trust and Society. SJS’s core mission is the economic, social and political empowerment of rural women in the Nakhatrana and Lakhpat blocks through a range of capacity building initiatives and development programmes. To facilitate the social empowerment of women. To improve the economic security of women, in particular, and the community, as a whole, by ensuring the development of traditional livelihoods like dry land agriculture and animal husbandry as sustainable economic options ; providing access to financial resources and contributing to the management of natural resources. To enable women to effect village development by becoming active citizens and ably participating in the Gram Panchayats (local governance institutions).